Why preserve published articles? Great press deserves a little TLC. Congratulations again on your published article! Your spotlight in the media proves that somebody out there really likes what you are doing - keep up the good work. You might be asking yourself why would I want to get a plaque in the first place. We agree and whether or not your decide to preserve your articles with us or not we hope you take the time and realize you have a golden opportunity with your recent media exposure. Let's say you decide "Yes" and preserve your article and create your custom wall plaque from In The News, "smart move", don’t stop patting yourself on the back yet. There are a few more things you can do to make the most of your press! "Great media exposure is like winning the lottery, it's found money, you need to be grateful and realize someone else just did all your work." You got it, now flaunt it! Don’t forget to show off your new plaque accordingly! Our clients tell us displaying their mounted articles in entranceways, waiting rooms, and even offices is a great way to sell your company to customers before you even have to open your mouth. Let your company speak for itself – customers are always impressed with good press. Spread the word! Social media is another great tool to promote your featured publication. Be sure to share your accomplishment with colleagues and customers via Facebook, Twitter, LinkedIn, etc. 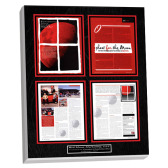 Post a photo of your plaque or link to the digital version of your published article. You’re entitled to some bragging! It may seem trivial but showing off great press is essential. The nice part about having your press and articles preserved and displayed is you don't have to really promote yourself, you let the magazine or newspaper do it for you. Let the industry you where featured in do all of your promotion. A strategically placed custom wall plaque of the article might be the icing on the cake. If you have any questions feel free to come back and visit our site. You can call us @ 800-548-3993 and ask to speak to a representative. Don’t forget to follow us on Twitter (@InTheNewsINC) or like us on Facebook (In The News, Inc.) while you’re online! We’d love for you to be a part of our online community!